A Stanley Cup final that seemed improbable eight months ago begins on Monday when the expansion Vegas Golden Knights host the Washington Capitals in Game 1. The Canadian Press breaks down some of what the teams will have to offer in a series that opens Monday just off the Las Vegas Strip. Golden Knights centre William Karlsson shoots against the Winnipeg Jets on May 18, 2018 in Las Vegas. Tossed aside by their former clubs in the expansion draft or via trade, the Knights forward group has shown impressive skill, speed and flat-out desire throughout the regular season and into the playoffs. The top line of Jonathan Marchessault, William Karlsson and Reilly Smith has combined for 47 points in 15 postseason games, but the second unit of James Neal, Erik Haula and David Perron are almost as dangerous to lead a top-six that relentlessly pressured the puck in playoff victories over the Los Angeles Kings, San Jose Sharks and Winnipeg Jets. Capitals left wing Alex Ovechkin winds up for a shot during Game 4 of the Eastern Conference finals against the Tampa Bay Lightning in Washington on May 17, 2018. 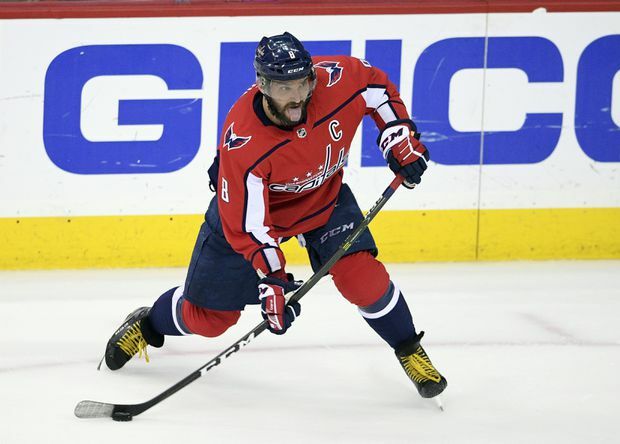 Alex Ovechkin’s joy at the conclusion of Washington’s Game 7 triumph over the Tampa Bay Lightning in the Eastern Conference final is something Capitals fans will remember for a long time. The face of the franchise since his rookie season in 2005-06, the 32-year-old Ovechkin endured heartbreak after playoff heartbreak until finally reaching the third round this season. Ovechkin (22 points) and linemate Evgeny Kuznetsov (24 points) lead the playoffs in scoring. The Capitals took the body to Tampa in Games 6 and 7 of that series, so expect a similar physical approach in the final. And keep an eye on the injury to Nicklas Backstrom’s right hand suffered earlier in the playoffs that forced him to miss four games. He’s returned to the lineup, but used his left hand in the handshake line against the Lightning – a clear sign he’s nowhere near 100 per cent. 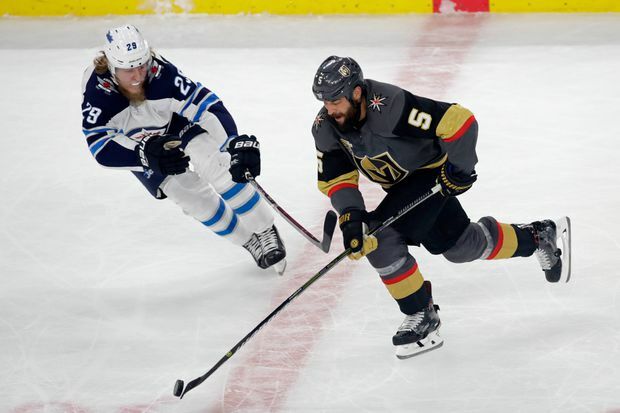 Vegas defenceman Deryk Engelland skates up the ice with the puck against Patrik Laine of the Winnipeg Jets during Game 3 of the Western Conference finals on May 16, 2018. Vegas doesn’t have the name recognition on its blue line as some of the teams its beaten in the playoffs – see Drew Doughty and Brent Burns – but it hasn’t mattered. The Knights have a skilled puck mover on each of their three pairs in Nate Schmidt, Shea Theodore and Colin Miller. Theodore has two goals and five assists in the playoffs to top the Knights’ defenceman, but that’s good for just 13th over all across the league. Dependable de facto captain Deryk Engelland provides size, toughness and experience. 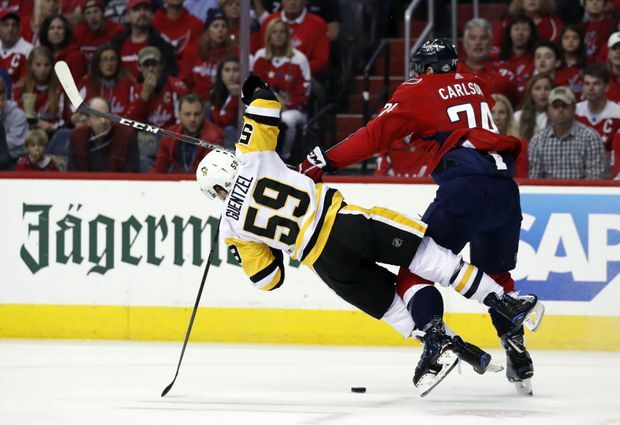 Capitals defenceman John Carlson collides with Pittsburgh Penguins centre Jake Guentzel on May 5, 2018, in Washington. Pending unrestricted free agent John Carlson’s next point in the playoffs will give him top spot among defencemen in 2017-18 with 17. Like Ovechkin, Carlson endured a number of playoff disappointments in Washington before this spring. Dmitry Orlov and Matt Niskanen make up a desirable second pair, while veteran Brooks Orpik anchors the third unit. Golden Knights netminder Marc-André Fleury makes a save against the Jets during Game 5 of the Western Conference finals in Winni;peg on May 20, 2018. What more can you say about the performance of Marc-André Fleury? The three-time Stanley Cup champion with the Pittsburgh Penguins posted a career-high .927 save percentage in the regular season, and has gone a step further to backstop this incredible Knights’ run in the playoffs with a .947 mark. 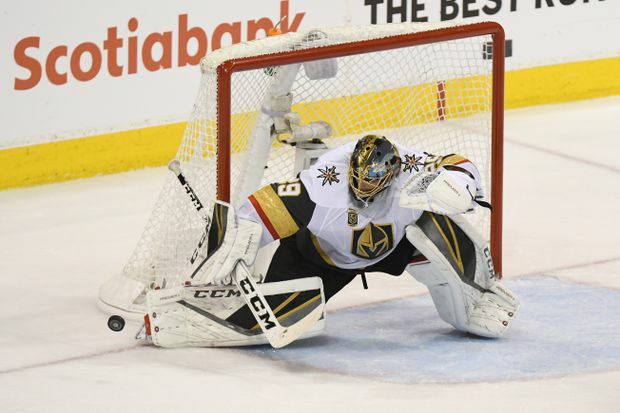 While Vegas has played well, when things break down, Fleury has been there time again with a number of incredible saves, especially in Games 3 and 4 of his team’s victory over Winnipeg in the Western Conference final. Braden Holtby of the Washington Capitals deflects a shot against the Tampa Bay Lightning on May 23, 2018. Not even Washington’s starter to open the playoffs, Braden Holtby wrestled his old job from Philipp Grubauer and hasn’t looked back. 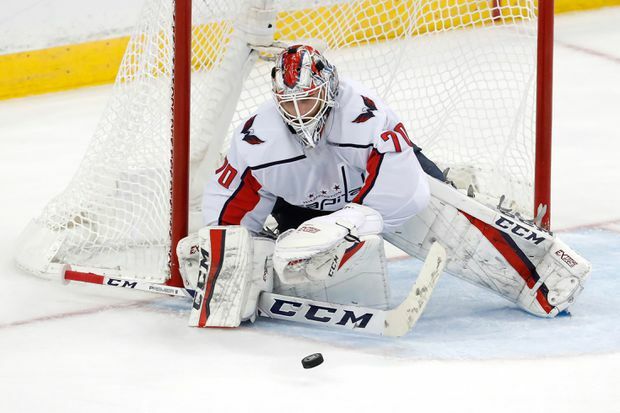 He picked up shutouts in Games 6 and 7 of the series with Tampa Bay – stopping 53 shots in total – as the Capitals fought back from a 3-2 deficit to advance to their first Cup final since 1998. The razor-focused Holtby didn’t look like his usual self at times this season, but has found a way to put things together. 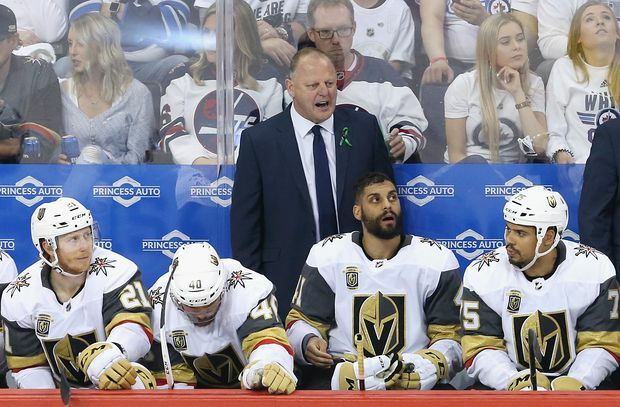 Vegas head coach Gerard Gallant reacts to a play during Game 5 of the Western Conference finals against the Winnipeg Jets on May 20, 2018. Perhaps the biggest accomplishment of Vegas head coach Gerard Gallant this season was getting his players to believe. A roster with zero history together when they gathered for training camp in September, the Knights are a team that rarely gets outworked and fights for one another on every shift. A finalist for the Jack Adams Award as coach of the year thanks to a stunning 109-point campaign, Gallant has shown an ability to change the Knights’ style of play depending on what opponents have thrown at them in these playoffs. 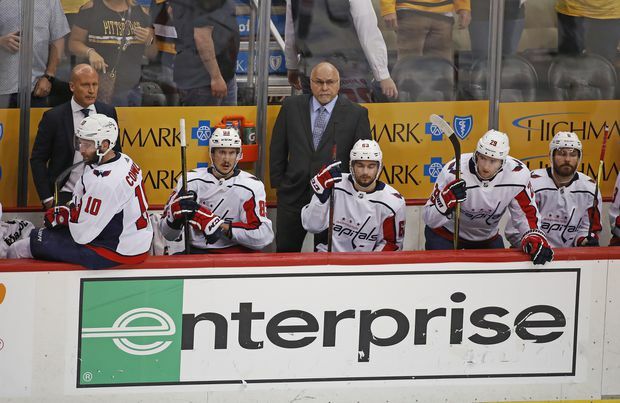 Washington Capitals coach Barry Trotz looks on from behind the bench during Game 4 of the team’s second-round series against the Pittsburgh Penguins on May 3, 2018. Minus a contract for next season, Barry Trotz went into the playoffs with an uncertain future. He no doubt knew that if Washington faltered again, he would soon be looking for work. With that hanging over his head, Trotz has pushed all the right buttons in victories over the Columbus Blue Jackets, the dreaded Pittsburgh Penguins – who had beaten Trotz’s Capitals in the second round the past two seasons – and then finally Tampa Bay to advance to his first Cup final.